On 21 April, NYU Berlin will host an event, Women, Gender and Media Images of the Refugee Crisis: Germany in Global Perspective, that will bring together scholars to discuss this complicated and vibrant topic. The program will be moderated by Taiye Selasi, a writer and photographer. 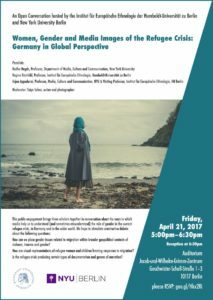 How can we place gender issues related to migration within broader geopolitical contexts of violence, trauma and gender? How are visual representations of refugee women and children framing responses to migration? Is the refugee crisis producing certain types of documentation and genres of narration? Ogranized jointly with the Institut für Europäische Ethnologie der Humboldt-Universität zu Berlin, the program is 5:00 – 6:30 pm in the Auditorium of the Jacob-und-Wilhelm-Grimm-Zentrum, Geschwister-Scholl-Straße 1–3, 10117 Berlin. A reception will follow.